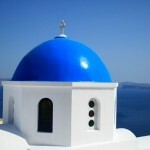 Santorini is one of the most popular – if not the most popular – island destinations in all of Greece. Also known as Thira, Santorini is actually made up of smaller volcanic islands. It is also part of a bigger group of islands more popularly known as the Cyclades. To get to Santorini, you can either hop on a plane or take a ferry. The airport is about 8km from the capital of the island, Fira, and it services domestic flights as well as chartered international flights. The cheaper – but longer – alternative is to take a ferry from Piraeus. Once on the island, you can get around by bus, the network of which is quite vast. You can also take a taxi or rent a car. If you like physical activity, you can rent a bike for the duration of your stay. The weather in Santorini is practically perfect throughout most of the year. It is especially sunny from April to September, which is why this is the peak season for tourism in Greece. In any case, the moment you arrive in the island, you will find yourself facing breathtaking views and feeling warm sunshine on your skin. Santorini’s beaches are revered all over the world, and the best beach is The Red Beach, which is located near Akrotiri. It may not be the most frequented beach by visitors, but the peace and quiet is well worth it. Other beaches that you would want to visit are Kamari, Perissa, and Monilithos; these all have rich black sand and pristine deep blue waters. 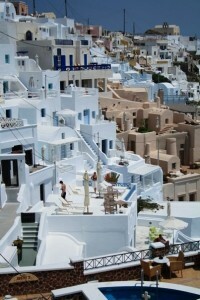 Aside from beaches, Santorini is known for its picturesque villages. While there are some newly built villages especially for tourism purposes, you should visit the villages of Oia and Fira, which are built on cliff tops and offer astounding views. You should also visit the volcano, which is located between Santorini and the Thirasia Islands.